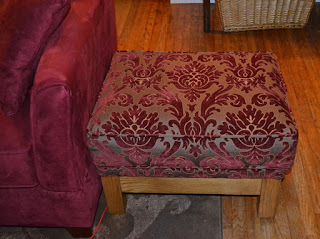 This weekend's sewing project was a DYI home dec project. Have I mentioned that I hate home dec? Well, I do. However, this one turned out to be mostly fun. I've never done upholstery before. It always looked hard. It was hard, but oh so very satisfying to do. This is the after picture. I'm still amazed that I made this beautiful ottoman. The fabric came from a local home dec fabric shop, Big Y Yardage Outlet. I wanted four yards, but they only had three, but when I took it off the roll and measured it, there was an extra 3/4 yards on the roll. Score! I have plenty now for several throw pillows. 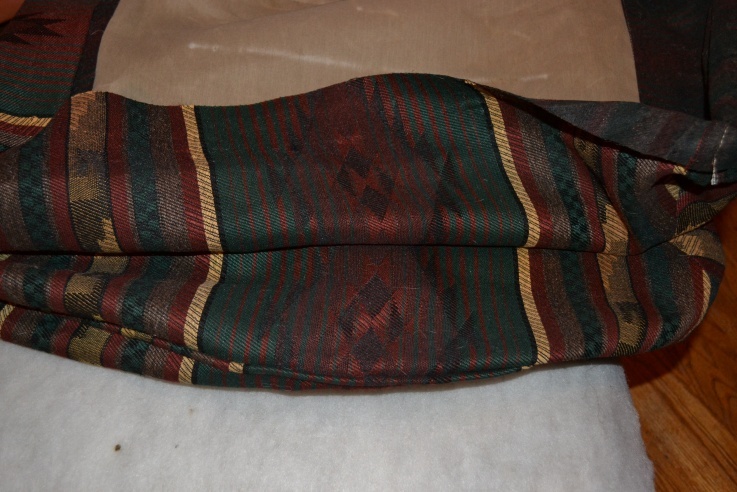 The appeal of this fabric was that it goes with both my red sofa and my brown love seat. I'm hoping they will both look like they belong together. 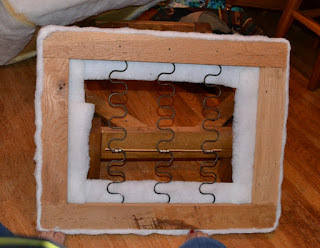 Once I took off the cover, I got a good look at how the pillow top is attached to the board. I would never have figured that out. I still didn't do it how they did it, mine not being quite as professional as theirs, but it got the job done. 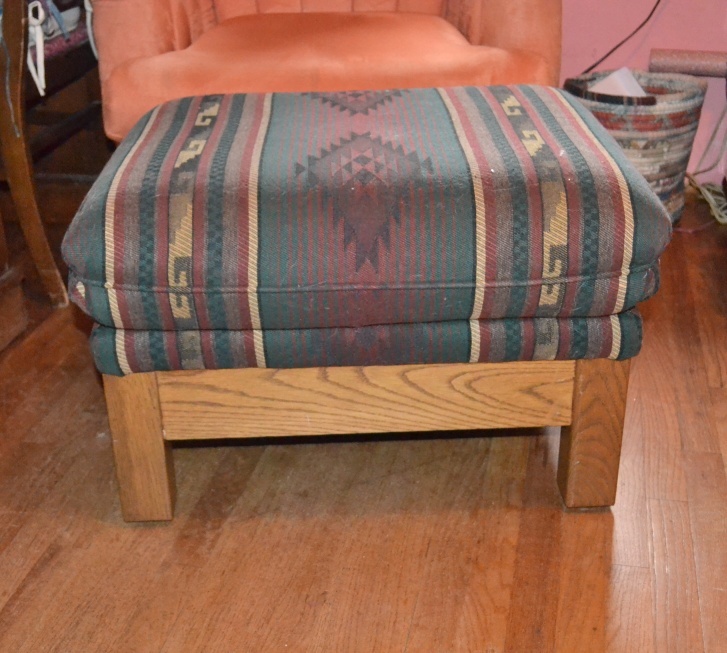 My ottoman went with my expensive mission style chair that I just sold on craigslist. 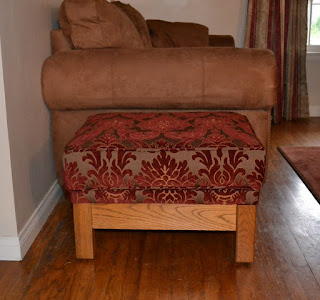 It was much too big for the room, but the ottoman can be placed in a corner of the room and pulled out for comfortable TV watching or extra seating so I kept it knowing full well that it needed a new cover. 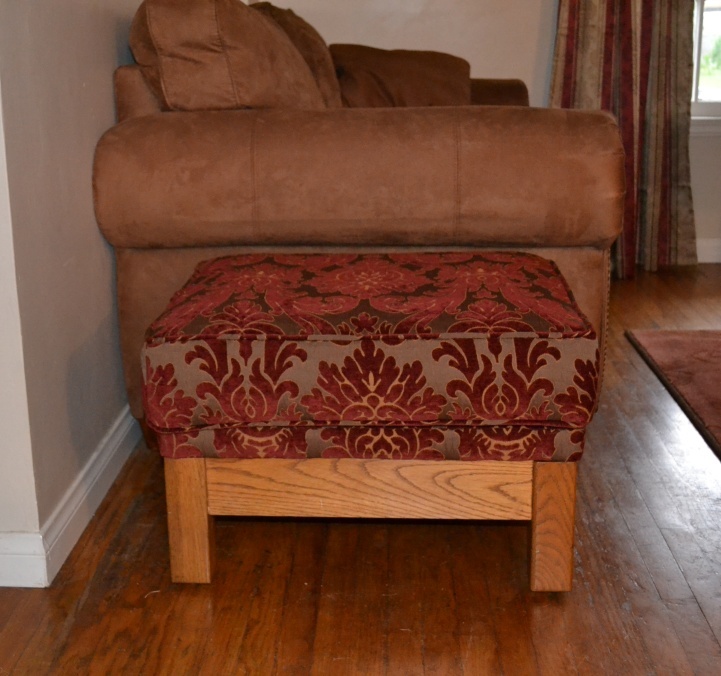 The ottoman is very comfortable to sit on since it has a spring seat instead of a hard board underneath the pillow. 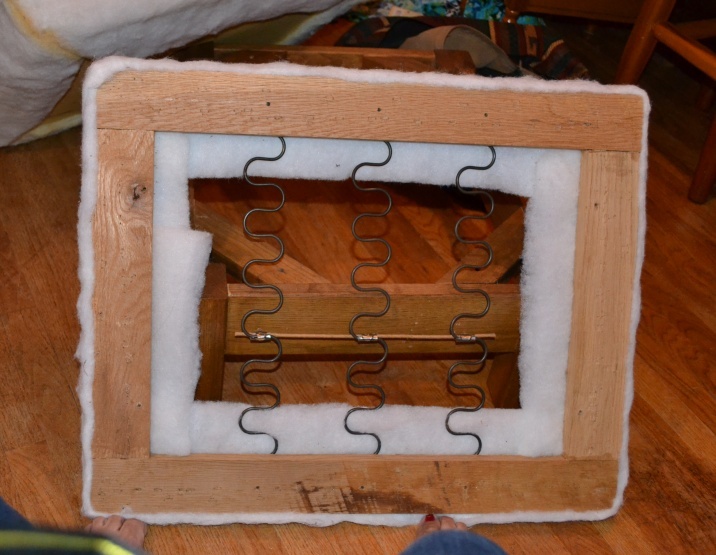 I was surprised to find that the cover included a zipper to install the cushion. I used this method as well. Good thing you can't see the robin's egg blue zipper. I didn't see any reason to go out and buy a matching one since no one will ever see it. See how well it goes with the brown loveseat? I think it looks great with either piece of furniture. 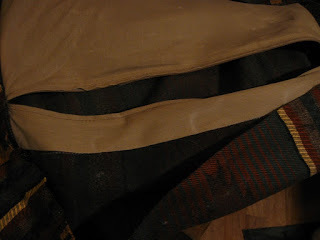 Really, the hard part was cutting out the fabric. See what a good job I did matching the pattern. I put the large motif in the center of the top. It looks off center from here, but trust me, it's perfect. Then the box band flows down over the side with a good match and then down to the board cover, it matches as well. My home is in the middle of a kitchen remodel project so I'm a bit focused on the house. The next few project I sew will be more home dec. I need new curtains in both bathrooms and in the kitchen. 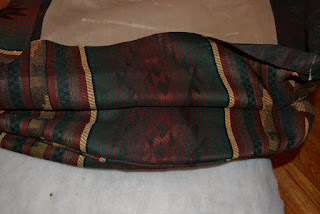 I also want to use the ottoman fabric and make pillows for both sofas. The t-shirt project has been set aside for awhile, but not forever. I'll get back to it during my Christmas break. Two weeks to do nothing but sew. I love my job! It looks great. I need to redo a few pieces, but I'm afraid to start them and lose interest and on something major, I think it would cause a fight with my hubby. Ohhhhh, a red couch. How cool!!! 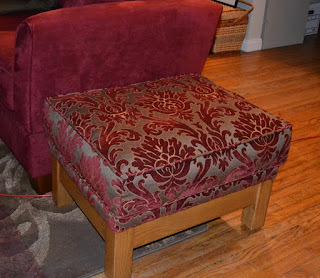 The ottoman is lovely but, man, A RED COUCH!!!!!!! You know where to send it when you're done with it. Looks great. I got the home dec bug a while ago. It is fun but I have to pick simple projects because i am so impatient. I'm jealous you get to sew for two weeks Have fun!! Beautiful job! 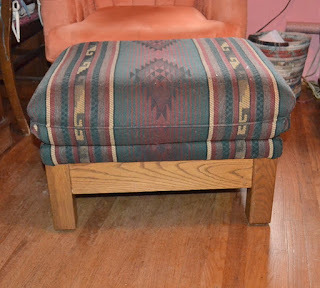 That is a whole new look for the ottoman. I am highly impressed with your pattern matching skills and patience. You did a great job on this! Adore your fabric choice. Though home dec can be ho-hum to sew, it's almost more satisfying than garment sewing because we see these home projects every day, right out in the open, compared to garments that might only come out of the closet a few times a month. That said, I don't plan to do another slipcover anytime soon. I'm with you, while I love sewing ( and weaving and knitting and spinning) I really dislike doing home dec. projects. I still have linen curtains hanging in the living room....unhemmed. Oh lord, have I admitted that publicly? Anyway, your ottoman came out fantastic and it does bridge both pieces so nicely. Great job!